Kraus Anderson’s new 5-story, 100,000 square foot corporate headquarters is one of the buildings on a full city block that includes The H.Q., a 17-story apartment building; The Elliot, an 8-story, 168-key Marriott Autograph hotel; Finnegan’s House/FINNovation Lab, a craft brewery/taproom and small-business incubator; and an underground parking structure for 500+ vehicles. MBJ is structural engineer of record for the entire multi-phased development. The office building consolidates Kraus-Anderson’s Twin Cities business operations in one downtown location and, in addition to workspace, includes a fitness center, training area, and cafeteria. The building is framed mainly with structural steel and features a monumental stair with a large floor opening between levels 3 and 4 and a rooftop deck on level 5 that looks out onto the downtown Minneapolis skyline. MBJ designed steel framing members with large web penetrations for HVAC ductwork to meet story clear heights that maximize daylight and preserve valuable headroom in the open workspace. 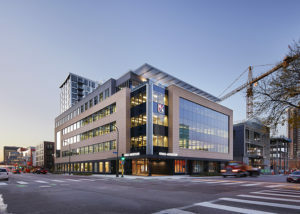 MBJ also carefully coordinated the connection of up-to-40-foot precast concrete panels to the primary building structure, which involved the management and timing of extremely large loads and high performance expectations. Green concrete mixtures using fly ash, slag, and other green materials specified by MBJ, plus energy efficient windows and HVAC systems, contributed to the building’s LEED certified status.